Just before August is over I am back in my internet kitchen! I needed this rest a lot and it was really relaxing! We didn’t go anywhere, but living in an island makes you feel like a tourist and you are in a vacation mood anyway! My baby boy is growing older (he is 8,5 months old) and we are crazy for him! He is so adorable and the communication with him has become more interesting. He has become a bit naughty, he has his habits, likes and dislikes…The good thing is that he eats gladly and feeding him is really easy! He is fond of veggies and fruit! Well, this is not unexpected at all, right? His favourite meal though is mom’s milk! I feel so blessed that I breastfeed him! It is such a magical experience! I get the blues whenever I think of the moment of weaning…Hopefully that won’t come soon! Let’s move on to the recipe now! My absence from the blog was beneficial! I had plenty of time to improvise, cook and shoot! Don’t think that I was lazy and that I refrained from cooking! It has been a very productive period as you will see in the future posts! 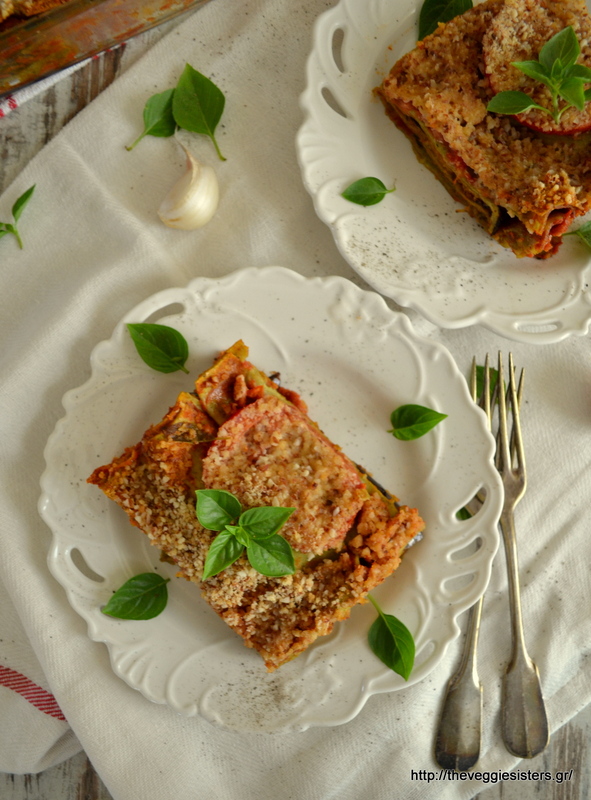 Today I present you one of my favourite dishes for this summer: vegan eggplant lasagna with fragrant tomato basil sauce topped with an almond crust! This is a winner, friends! Trust me! The almond crust makes cheese absolutely unnecessary! Go get some eggplants now that they are in season and make this dish! I will be waiting for your feedback! I bet you will enjoy it too! Slice eggplants and soak them in a bowl with salted water for 30 minutes. Then rinse them well. In a small bowl combine olive oil with oregano, garlic powder, salt and pepper. Brush each eggplant slice from both sides with this mix. Lay them on a baking sheet lined with parchment paper and bake in preheated oven for about 40 minutes at 180 C until golden brown. In the meantime make the sauce. When ready, remove from heat and pour the milk. In a blender pulse almonds with rusk until powdered. Grease a baking dish and lay lasagna sheet (I doubled the layers, that is I used 32=6, 63=18 lasagna sheets. If you use half the sheets (9), it will become less filling. Then pour some sauce, lay roasted eggplant slices and keep on doing this until the final layer is lasagna. Pour the remaining sauce, top with the tomato slices and sprinkle with ground almonds. Cover with aluminium foil and bake in preheated oven at 180 C for about 40 minutes. Then uncover and bake for another 20 minutes until glden brown. Remove from the oven and allow to cool before serving. Enjoy! 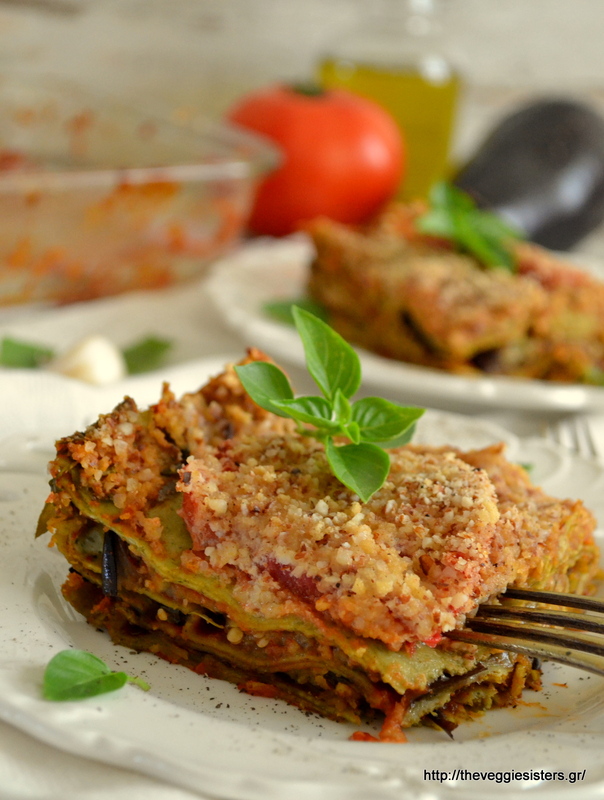 Share the post "Vegan eggplant lasagna"